An interview with Cardinal Walter Kasper on the post-synodal Apostolic Exhortation on the family and the debate that it sparked in the Catholic world. Q. 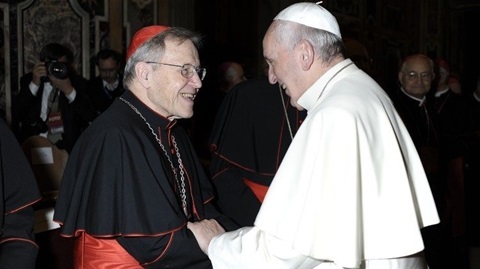 - Cardinal Kasper, in the first pages of your book, you underline that Amoris laetitia does not contain any new doctrine, but creatively states the tradition in a new way. Can you explain this? R. – Tradition is not a stagnant lake, buti s like a spring, or a river: it is something alive. The Church is a living organism and thus it always needs to validly translation the Catholic tradition into contemporary situations. This is the meaning of the renewal about which Pope John XXIII spoke. Q. – What is the greatest help which, according to you, Amoris laetitia gives to today’s families? How can this document “accompany” the daily life of families? R. – I know a few parishes, also some here in Rome, who have meetings with spouses or with engaged couples preparing for matrimony and they read parts of the Apostolic Exhortation. This document’s language is so clear that any Christian can understand it. It is not high theology incomprehensible to people. The Pope of God are very content, and happy with this document because it gives space to freedom, but it also interprets the substance of the Christian message in an understandable language. So, the People of God understand! The Pope has an optimal connection with the People of God. Q. – As everyone knows, in his first Angelus as Pope, Francis cited your book entitled “Mercy.” Why do you think that mercy is so important in this Pontificate, especially when considering the world of the family? R. – Today we are living a violent time which has never before been experienced. Many people are wounded. Even in marriages there are many who are wounded. People need mercy, empathy, the sympathy of the Church in these difficult times in which we are living today. I think that mercy is the response to the signs of our times.